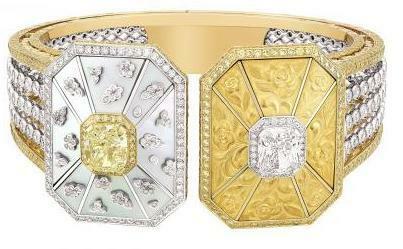 Boucheron launched it's Automne - Hiver 2011 - 2012 collection on the Riviera theme. Having just come up from there to Paris this made me smile and I found a lot of beauty here to suit different tastes. Perhaps you could almost call this a Jewellery Cruise collection but the effect was unmistakable. Sparkling light everywhere and the invocation of the Ocean was a great contrast to the backdrop of the Place Vendome. The collection was worked around five paradise islands Beau Rivage, Paraggi, Capriccioli, Aiguebelle and Isola Bella. Isola Bella was by far my favourite and the first set shown below. I was very taken with the Golden Yellow tones of this Parue below set with Stones in Emerald, and light pink Amethyst colours. 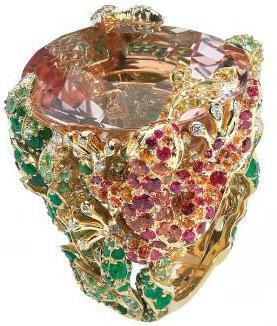 The Gold, Pink and Green blend together wonderfully and give a warm radiant glow of colour. I also noted the use of Yellow Sapphires to give warm Amber tones that seemed to soak in the Sunlight and reflect it out marvelously. Positioned near the windows of the Palace town-House overlooking the Place Vendome these pieces seemed to gather and store the sunlight and in turn radiate it outwards into the room. Very, very beautiful. I was instantly captivated by the necklace and it's something I would choose to wear myself with out hesitation. 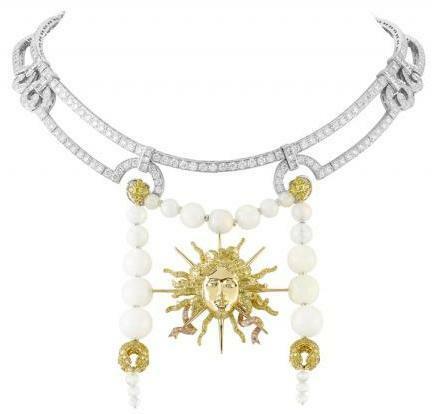 Essentially composed in two parts or structures, the higher part encircling the neck is static and jointed to move with the wearer while the lower part is lose roses of exquisite captivating beads. You could wear this with a variety of outfits and I think it could be worn all year round to events. The pair of earrings shown above work loosely with the croix or cross Rosette theme. Also the Bague (ring) to the right of the lower pair of earrings centered with a wonderful Amethyst demonstrated another interpretation if the design. The rosette theme for me echoes both Stained Glass windows in Cathedrals in Europe and also aspects of Islamic architecture. The perfection of the proportion and symmetry are captivating and there is something in the form that will suit ladies of all face shapes and complexions. 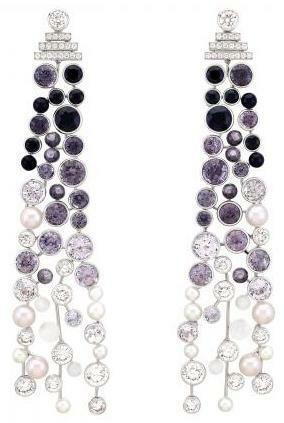 Both sets of earring would be delightful to ware and they move delicately as the wearer move due to the jointing. I think a Moroccan influence is coming to mind here. 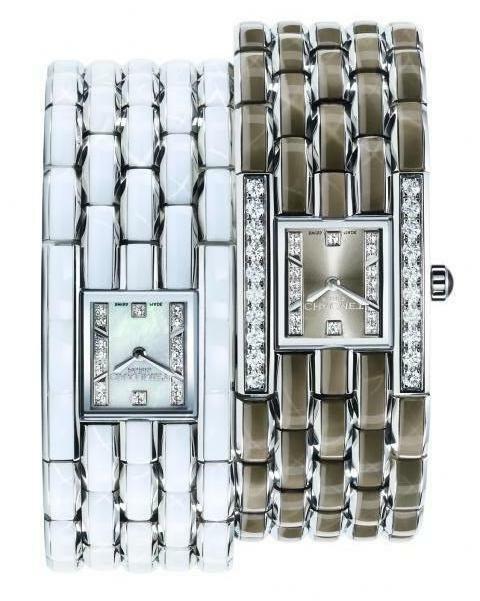 The ladies wrist watch above right also doubles as a bracelet. The face has a cover that can be fastened closed so that more most of the time the wearer appears to have a beautiful bracelet on her arm and the face of the watch is discreetly hidden and protected. The face of the dial of the watch is delicate mother of pearl and this sits inlaid into the bracelet providing a bright contrast to the warm coloured gold and stones that surround it. The benefit is that even though the face may be small in the style of a traditional ladies watch the colour contrast enables the wearer to pick out the hands telling the time easily. I really liked this piece. Again a beautiful Rosette theme is person in the craftsmanship as the side of the watch carries the Rose inlaid into the gold body of the watch. 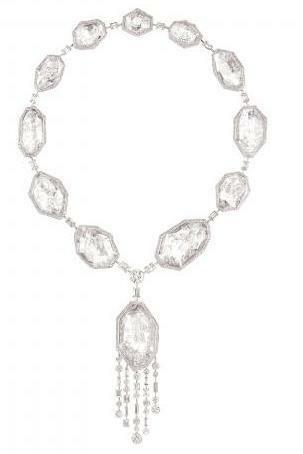 This necklace is from the Beau Rivage part of the collection. I love the way it snakes slightly around the collar bone and sits very lightly on the chest of the person who is wearing it. A cabochon cut Emerald sits centre stage at the heart of the piece while surrounding it are oval cut Sapphires. Pave cut diamonds complete the composition of the stones and all are set on a base of White Gold. 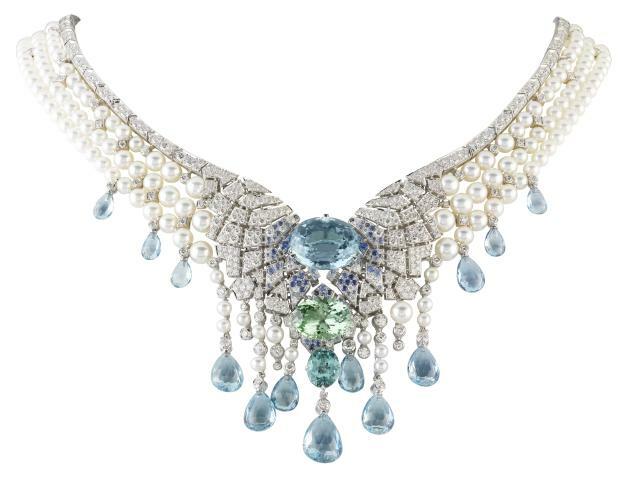 As with many high jewellery pieces there is a trick in this necklace. The centre piece featuring the Emerald can be removed and worn as a separate clip piece. Below to the left are a beautiful pair of earrings and a bracelet also from the Aqua themed Beau Rivage series within the collection. The composition appears simple at first glance but this does not detract from the stunning quality of the stones used. The necklace the the right above is from the Paraggi part of the collection. Using pearls, turquoise and coral to capture the magical nature between the land and the sea this is a very feminine piece that could be worn anywhere. I can imagine it being worn in a city or at a Private dinner in the country but also I 'see' a girl walking along a beach wearing it, in a bathing suit or bikini and wearing a sarong perhaps. It's a piece to be enjoyed anywhere. 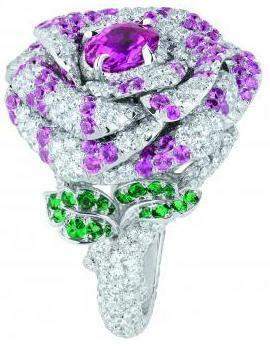 My love the Rose is perhaps easy to guess from looking at this site so I was spellbound by the pieces below created by Dior Haute Joaillerie. 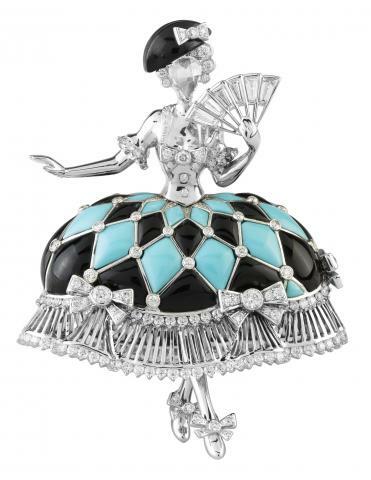 Dior's collection Les bals des roses was designed by Victoire de Castellane to evoke the romance and glamour of the great 19th century balls in Europe. 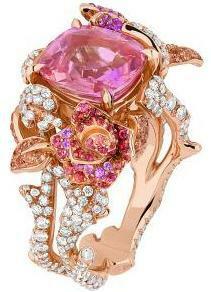 Victoire used the symbol of the Rose as the flower most dear to the traditions of Dior. Through using Sapphires, spinals and beautiful crystals she hoped to create a harmony that would evoke the rhythm of the great Viennese Waltz. Several balls are celebrated. The Bal de Champetre, le Bal d'Autrefois, le Bal de Paris. 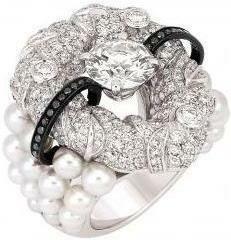 Each is a piece of social history in it's own right and a suite of jewellery was made to match with each one. Here above are three rings they are in identical setting frames, the only difference is the colour of the stones used to make up design. 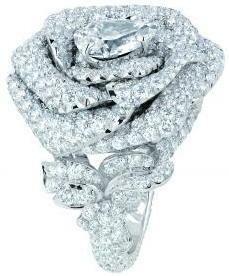 So going anti-clockwise from left to begin with is a Rose of pure White diamonds set in White Gold. The brilliance of this piece is absolute and stunning. 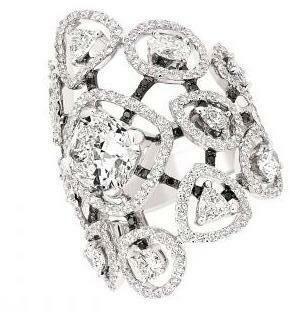 The bague contains over 100 diamonds and actually sits very sensibly on the finger. 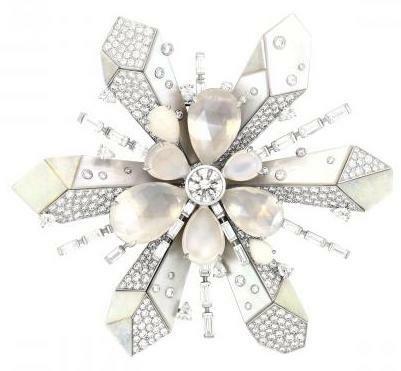 The petals of the form of the Rose are delicately folded in a way to make this piece very in-obtrusive when worn. It's really a work of wonder. Clients wear Haute Joaillerie for many reasons but I think this particular ring would make a unique surprise alternative to the traditional engagement ring. Moving to the right more colour is worked into the design. 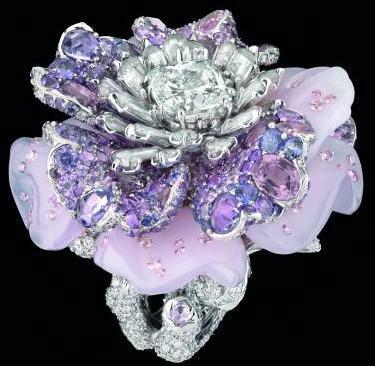 White diamonds constituting the shimmering petals are joined by Pink Sapphires with a large stone at the center of the flower. Nature's colour bursts into the stem with Emeralds on the leaf resting underneath the petals. The third Rose ring at the bottom is, as you may guess, my favourite. It's just so pretty. This ring is constructed in Yellow Gold and this allows the Rubies to shine back with greater truer brilliance. 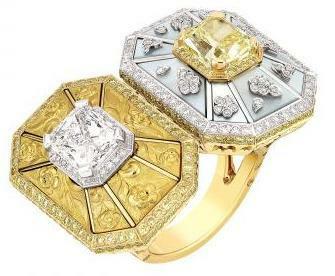 As you would expect from Haute Joaillerie even the setting for the center stone of the flowers is itself worked magnificently and here in the Yellow Gold you can see the detail of this working all the more clearly. You can also appreciate that the Ruby stones are cut to slightly different sizes to be placed onto the leaf of the ring. It's really extraordinary. 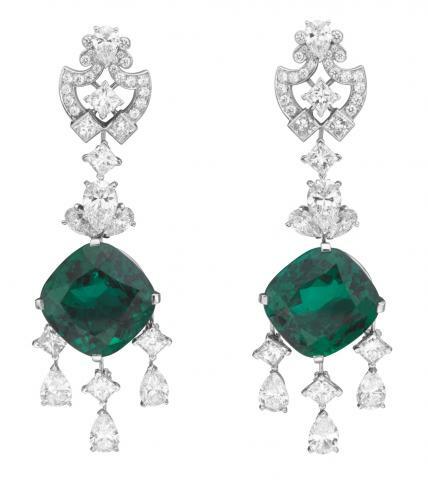 The Emeralds of the leaf stand out all the more strongly in this piece as they contrast brilliantly with the Rubys. It's a winning juxtaposition that has been used since Ancient India in Jewellery collections to great effect. Here are three rings of Roses. Following the style above there is first a set, White in Diamonds, then a set partially in coloured stones and then in very detailed full colour. These necklaces are extraordinary. 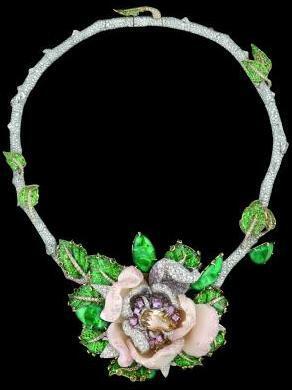 My favourite of this three would be the first one above left partly coloured with Amethyst and Emeralds. 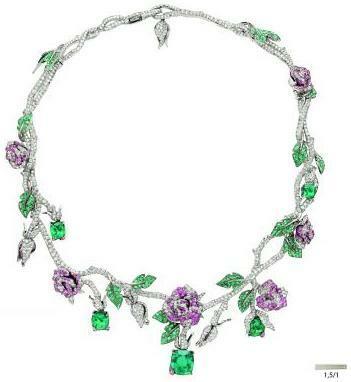 The necklace is completed with five large emeralds that hang from necklace. It's a delicately beautiful statement that would flatter anyone who wore it. As this is an Autumn-Winter collection I thought it was interesting to note the use of White diamonds to indicate cool ice and frost. 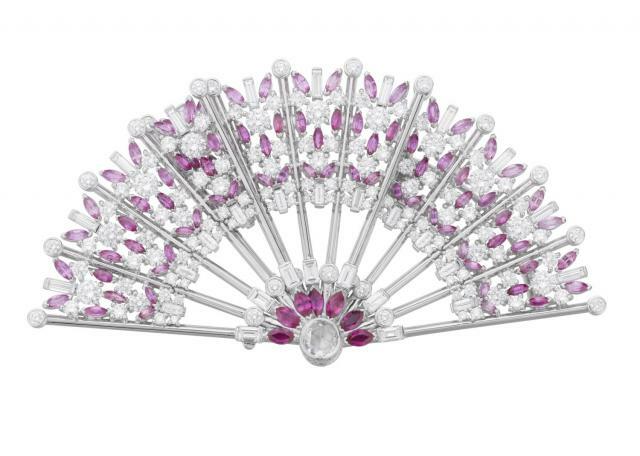 I think like many Haute Couture Joaillerie pieces, in reality these creations can be worn all year round. The craftsmanship in the third necklace at the base of the selection is a real showpiece of the expertise of the Joaillerie atelier. The leaves look very lifelike and it's really a piece to study. Here are three very beautiful rings from different parts of the collection. I can see how they were created with the inspiration of great European Balls as there is something in their energy that reminds you of dancing. I think it's something in the placement of the stones and the swirling effect initiating the folded layers of petals within the Rose flower. Everywhere in this collection the Rose and it's stem and vine are portrayed equally, not just the flower head. I think this is a great symbolic statement to emphasise play and the continuation of life through the craft of High Joaillierie. In the ring in the centre above I see that the form of the petals evokes the full skirts of court dress. Swirling in a Waltz the petals seem to hang in the air as if paused mid-turn. The Lilac and Blue hues are also coolly attractive and bring to mind going to a Winter ball with ica and snow laid thickly in the ground. 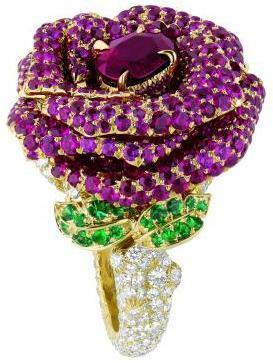 The third and last ring from this collection is a Firey Rose. The colours are more exuberant and energetic. The Rose is vivid. It's interesting to note the transparency of the centrepiece stone on the top that allows you to look down through the creation and see many reflections from different angles. 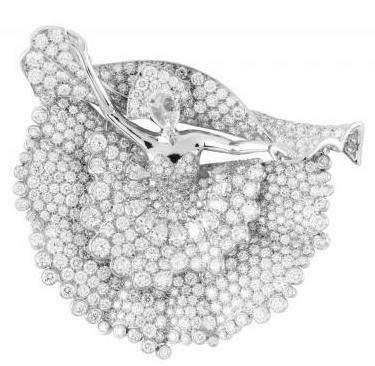 Van Cleef & Arpels chose this Summer to celebrate a series of legendary balls in the 19th and 20th Centuries. The balls celebrated were the February 1903 Costume ball at the Winter Palace in St Petersburg hosted by Tsar Nicholas II and Tsarina Alexandra, the 1966 Black and White Ball in New York hosted by Truman Capote. 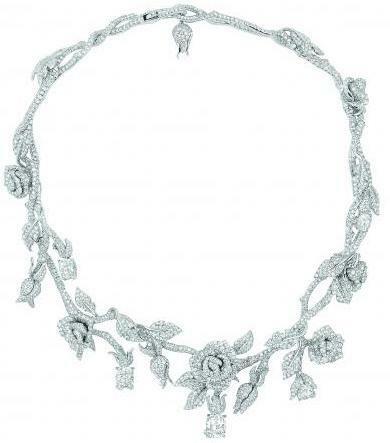 Suites of Jewellery were also composed to celebrate the Bal du Siecle September 1951 in Venice at the Labia Palace, the Bal Proust and the Bal Oriental held by Alexis de Rede. 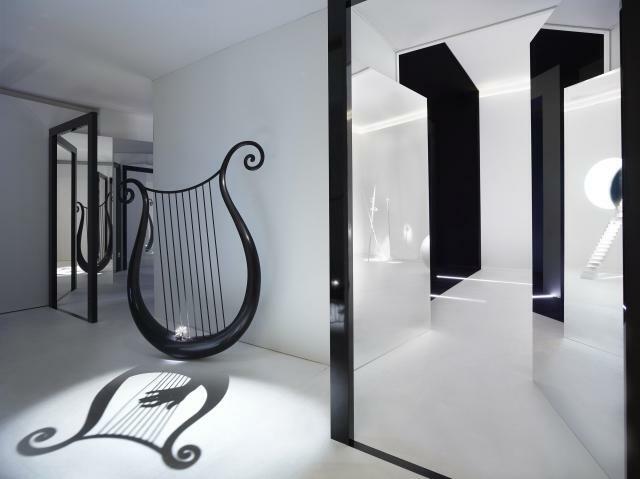 I met Nicholas Foulkes at Van Cleef in Paris when I saw the pieces and spoke with him about the balls and the book he has produced in conjunction with this collection. 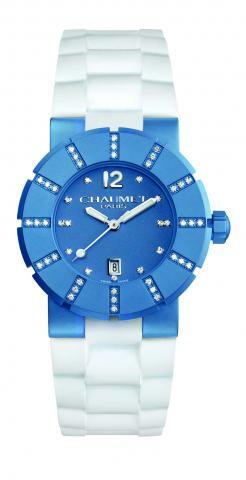 Chaumet launched it's 200th anniversary watch collection in Haute Joaillerie week. They have an amazing list of contemporary and achieve pieces spanning the length of their history. 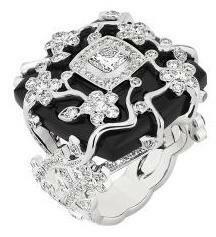 Above are two watched reminiscent of the Be My Love collection that I have spoken about the part. 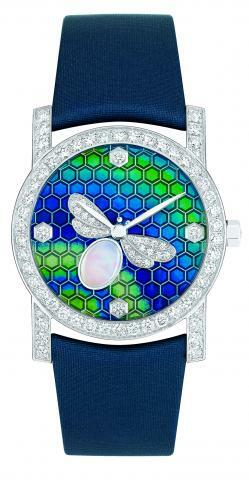 Bees are such as great emblem especially in time pieces as they represent the hard work and also majesty and mastery. Chaumet is proud of it's royal history and connections and traditionally the Bee has been the symbol of Royalty and royal favour. I love the colour contrast of the Honey-Gold colour and Aqua- Navy Blue and Green. Something for everyone. When you look at the watches in person you see a shimmering iridescence in the back-board of the watch. The diamonds set around the watch give watch extra shine and sparkle and compliment the shinning design of the White Bee figures themselves. Here to the left is another Blue watch from a different part of the collection. The Class One Titane Deep. A more simplified design this will also appeal to both men and women and has a sporty feel. Simple colours in White, Diamond and Light Blue it makes and uncomplicated addition to any outfit. Also from the Class One part of the collection is this amazing piece to the right. 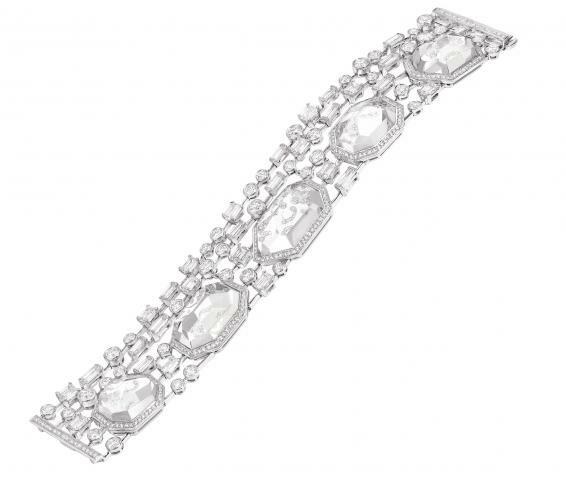 I think for most people if you asked them what they would expect from a Couture Joaillerie atelier when looking for a watch, something like this piece would come to mind. What sets this piece apart is the clarity of the stones used. This timepiece is luminous and pretty. I think it could be worn very happily by a Lady or Gentleman and like all the timepieces from Chaumet that I've seen it really will be one that will draw compliments. 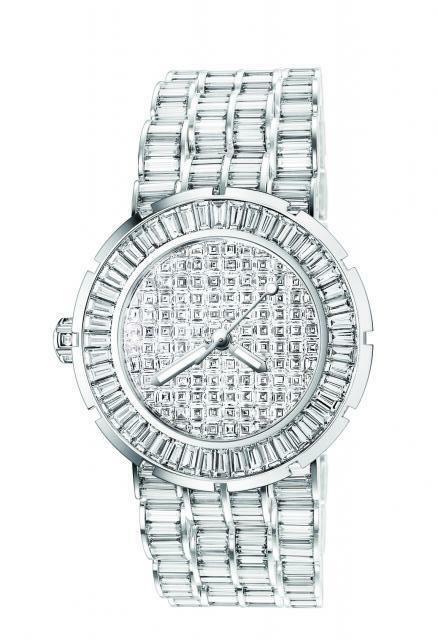 The watch face is beautifully presented with a grid pattern of square cut diamonds. I noted that a practical effect of this is that even in relatively dim light you will be able to read the time. This is a watch that will give a huge pleasure factor to it's owner. Chaumet have been creating wrist watches for a very long time. To celebrate this tradition here they have made an Art Deco inspired piece in the Ladies collection. For me as a girl I like a big watch face just the same as a man's. However looking at this object as a piece of Art work in the traditional form of a small ladies face - this is really exquisite. I love the elongated trapeze drop-shape of the face and the Black strap, Rose Gold and Diamond colour combination works really well. It's a fun piece that would make a great gift perhaps to an older member of your family or circle. But also I think there maybe more younger women who would like to wear it from a decorative perspective. For me the wearable watches are the ones above with big bold faces clearly telling the time. Below are the Khesis set of watches. Another small faced watch that also doubles as a piece of jewellery. Each could be worn as a bracelet. Each of the three would make a great addition to your ensemble and I would say my standout favourite is the Blue watch. 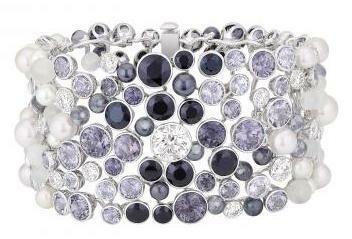 I love Blue and Grey together and the diamonds give the piece that perfect extra sparkle. 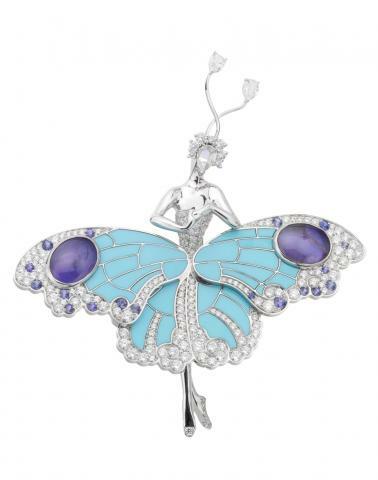 Chaumet are a wonderful house to spend time with and are eager to share their heritage with you. If in particular you would like to know more about the History of Tiaras in the modern age I advise you to get in touch and ask to view the collection at their Maison. recalled the ball took place against the backdrop of growing unrest) celebration of the Romanov near 300 year rule was to be feted. (C) All images by kind permission of Van Cleef & Arpels. Above - the Ice Crystal Necklace inspired by the Icy Russian Winters. 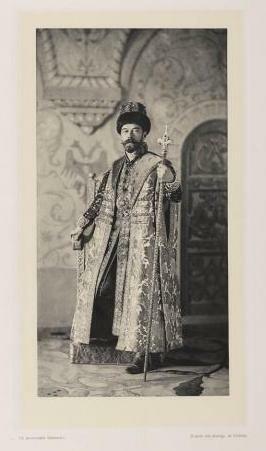 With the Historic collections of Royal clothes at their disposal from the Kremlin Palace the Royal couple were able to dress in the 17th Century robes of their forbears. Although western style became fashionable in the 18th and 19th centuries it's very interesting see original Russian style. I think the costumes must have been very heavy. Tsarina Alexandra wears quite a strained expression. Her outfit looks heavily embellished and I suspect may have been uneasy to move in. 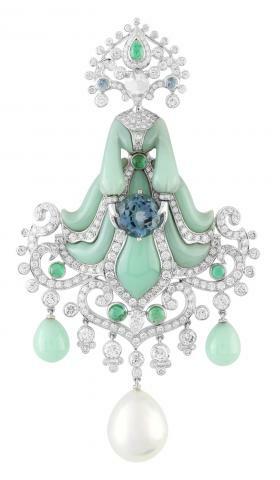 These pieces made by Van Cleef & Arpels in the modern time are constructed with such attention to traditional themes and executed so perfectly I think that they could have easily been worn by contemporary guests at the Ball. 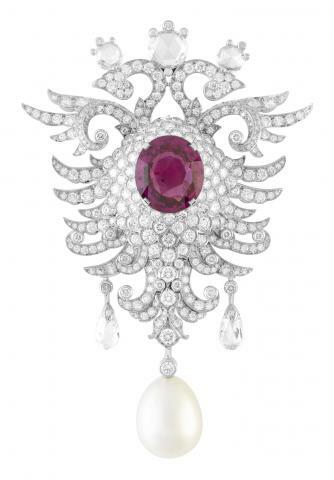 Above the beautiful 'Imperial Eagles' clip to the left celebrating the Romanov Eagle fashioned in eternal diamonds and with a Ruby at it's centre piece. It't a truly majestic Gem. The sort that would belong on a Royal collection. Next to the right is the 'Kokochnik Clip' set with Jade, Emeralds and Diamonds this piece celebrates the traditional head dress worn by Russian women from all walks of life on special occasions. If you look carefully you can see the figure of a woman underneath the head dress and the lower parts of the clip are an elaboration of her skirts. An absolutely perfect piece to wear to a ball celebrating Russian History and culture. This little Lady to the left has come to entertain the court. 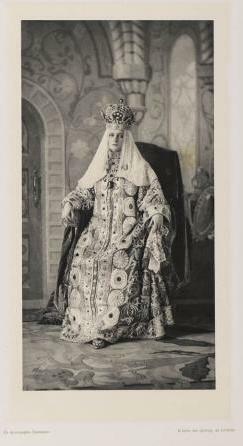 The Romanov dynasty where great patrons of the ballet through many generations and Russia and the territories that Russia grew to cover have many long traditions of folk dancing. Again note that she is wearing the traditional headdress. What a star performance and completely covered in diamonds. These two pairs of earrings are relatively simple in their design by the standards of High jewellery but their relative simplicity in terms of form and colour make them all the more stunning. The first pair to the left feature the Kokochnik headdress design again with the full lower tier of the headdress trailing downwards. The ropes of pearls hanging down act as a traditional veil. Almost what some women wore in the far east of Europe and in the Byzantine world where veils or half veils could be made of coins. 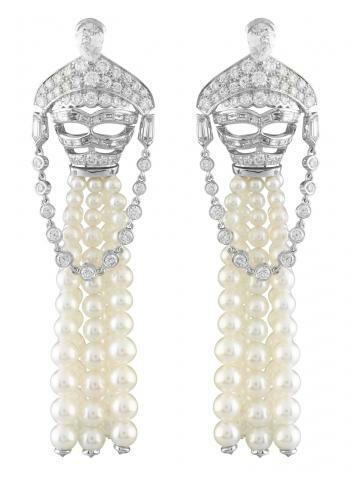 The Princess Cygne earring to the right evoke the Swan princess of legend. Diamonds and Emeralds together always make such a simple but beautiful contrast. Both pairs are very pretty and translated in practical terms could be worn with a wide variety of evening or occasion outfits.